You can now perform bulk renames with this utility. As I posted here, there was an issue with rename and that was because the way I was opening the outline. I was using the first option openOutline(true) – write mode and keep data in restructure. restructureCube(IEssCube.EEssRestructureOption.KEEP_ALL_DATA) it was removing the data with rename. keepTrans – true to keep transactions. If you are opening an existing outline to make changes (readOnly == false), and you intend to restructure the cube and keep data,we recommend that you set this flag to true. When true, a log is kept of activities done to the outline. If you are starting from an empty outline or are not planning on saving data when you restructure, we recommend that you set this field to false. When false, no log is kept, saving time and memory. You’ll see a similar output. I’ve not included the support for renaming the members in formula. You’ll have to do that manually. The tool will generate an exception if there is a validation error. Wud the same utility work on planning as well? Have data on d cube and just want to rename 1000 members. If you could have the utility change all upper level Sparse members to dynamic calc, this would be a very useful feature for migrating to Hybrid. Yes, this is Tim Faitsch. I will definitely give the utility a try if you can add that. I know Oracle had created a similar utility internally. I don't think it's available to the public though. 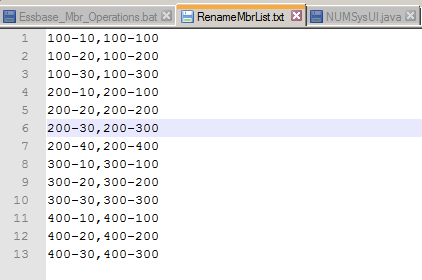 Hello Celvin, thank you so much for this tool, are you planing to add the Alias rename Bulk option ? Let me try and add that to the next version. Thanks, Akram. It will be great. Thanks Celvin. Let us know when you’re expecting to publish the new version. Thinking about this, Why cannot you create a load rule with the new alias and just load that info? I know it’s possible using DLR but we need to give users the possibility to change directly just member aliases as it will not have an impact on our data loading even if they make an error changing it. I’ve no idea what you are talking about. If your data load is using aliases instead of member names then you’ll have impact. You can create a dimension build load rule to just update aliases and have a file just for that purpose only. 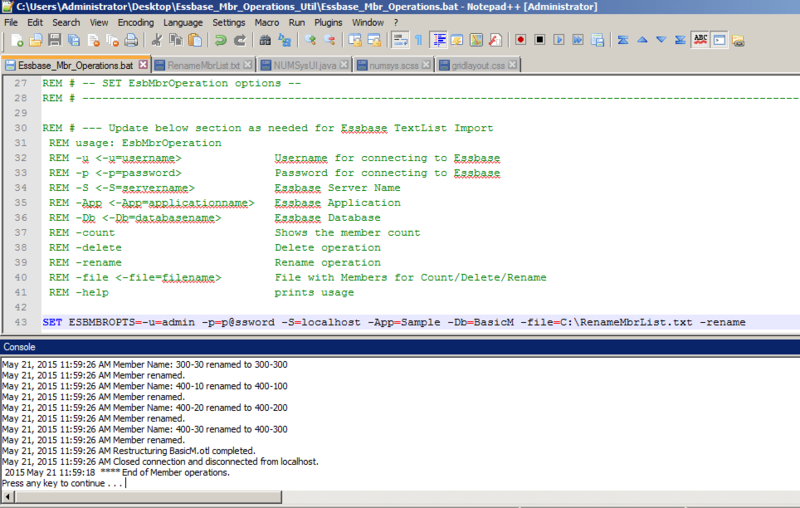 -I need to give the possibility to users to change only Aliases using a Powershell/silverlight that calls your Batch and copy the output they made handly inside the text file used by your utility, we already use data rules for updating our outlines but we cannot give users the ability to change Aliases using EAS. Users haven’t technical skills to do that, we only do that while loading data monthly. Alarm, I think you are not getting it. You can still do it using MaxL you don’t have to give them access to EAS. All I can see what is missing is if the members are coming at different levels. Otherwise you already got what you are asking for.